Just about everybody these days has more than one email account, usually more than can be counted on one hand. Personally, I have 8+ accounts with different email service providers, including Yahoo, Gmail, Aol, hotmail, etc. Currently, I use Outlook to check all of my accounts from one client application since it makes it easier to manage. If you’re ok with Outlook, then there’s not a problem. 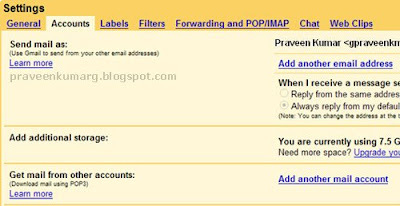 However, if you prefer to use Gmail for everything since it’s web-based and therefore not tied down to one computer like Outlook, then you might be interested in knowing how to setup all of your email accounts in Gmail so you can receive all emails via your Google Inbox. First, log into your Gmail account and click on Settings at the top right corner. Now click on the Accounts tab and click on Add another email account under the Get mail from other accounts heading. Now you’ll be presented with a little pop-up window where you can enter in the email address for the account you want to add in. The cool thing about this is that you don’t have to sit there and worry about finding the pop and smtp server names for your ISP, Google will automatically try to determine the servers for you based on the email address! After I entered my email address, Google automatically determined the POP server name and the port number. All you have to do is enter in your password for the account. You also have the option to leave a copy in your account, label the messages from the new account so you can sort them quickly, and to archive them directly so that they don’t show up in your Inbox. Now the email accounts will be checked by Google on some periodic basis and the emails will be retrieved and stored according to your preferences. Unfortunately, you cannot set the time period for the email checking. Even if you do not want to use Gmail as a catch-all account, it’s still a great way to backup all of your other email accounts, especially if you’re using Outlook. Just configure each new account to be archived automatically. That way, you can continue to check emails through Outlook, but it’ll all be backed up on Gmail too. If your computer crashes and you lose your Outlook data file, the emails will still be in Gmail!!! Enjoy!! !